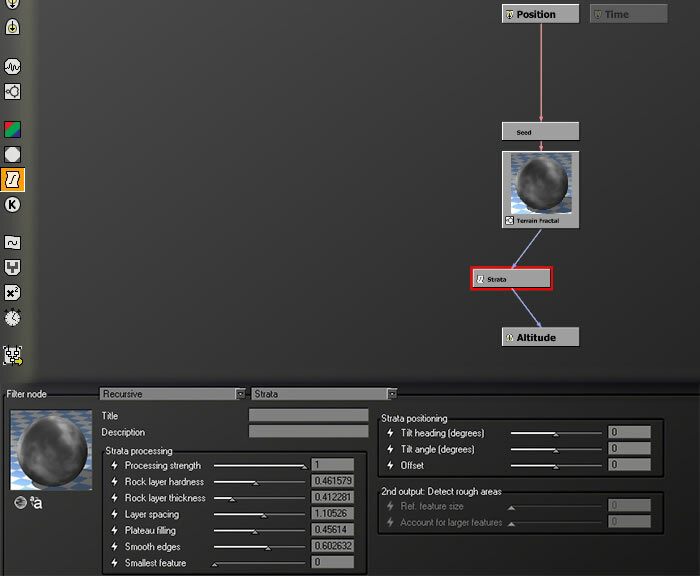 Vue 8 Infinite has a new and amazing node in the Function Editor. It is the Recursive node and is comprised of a Strata Filter and a Confined Strata Filter. Until I followed Dax Pandhi's new Training video, I was at a loss how to use it correctly. Sure, I experimented with it, but my results were hit and miss. After spending a morning on his tutorial, I was amazed at the results I could get. But Dax does not only deal with the filters, he takes you through an understanding of how the controls work and how they are interactive and dependent on each other. Dax Pandhi is the founder of QuadSpinner, a website that is a must if you use Vue. He starts by discussing how Fractals work, since the Fractal Terrain Filter is the base he uses, as well as how Vue processes terrains. Thus, you start using the Strata filters with an understanding of their "environment". It was amazing to me to see the slight changes in the controls and how they could affect the actual terrains. My first experiment with these filters. While the controls can seem complicated, Dax explains them so well that after a little while they make complete sense. To Users very familiar with the Function Editor Controls, the learning curve might be very quick; however, to those not very experienced with them, his explanations are clear and make a lot of sense. Below is just an example of my settings for the Strata Filter. Although Dax gives numbers for all the controls, each procedural terrain is different so the numbers will vary from his. Without this tutorial, I wouldn't have been able to start building terrains using the new Strata filters. It would have been too much hit and miss. While I have a long way to go to be able to control how I visualize the terrain and how it will turn out, I know I will be able to do this thanks to this tutorial. At the end of the video, Dax wet my appetitive by showing how multiple filters can be combined so that the terrain is comprised of a combination of sedimentary deposits and rock, for example. He does say that this information can be found in an earlier Training Video, Realistic Procedural Terrains. Beauty of Strata Training Video can be purchased from e-on software for $18.00 The amount of information you can receive from this tutorial is way beyond its cost. This is another fantastic tutorial from QuadSpinner. QuadSpinner has tutorials as well as products. They can be purchased from both e-on software and cornucopia3d. To see my review on Mighty HyperTerrains, Capturing the Brilliance of Light,and Realistic Procedural Terrains click on the links. Dax Pandhi is writing a comprehensive book on achieving realism in Vue. This book should be very exciting and informative.